Less Traveled Road (LTR) finally hits limelight over its ‘all walk’ audience at the Cowboy Town Bar and Restaurant (CTBR) at K.M. 6, La Trinidad, Benguet last February 21, 2018. Following the group’s guesting in a morning show in Baguio City, was the official launching and concert of the LTR music album. Dubbed as ‘all walk’ band, professionals, managers, youth, pregnant women, kids and people from the different Cordillera provinces crowded the venue. In a social media post in the official Facebook page of the @LessTraveledRoad after the concert, Mrs. Evelyn Miranda, remarked that the songs and the singing of the artists were so amazing, entertaining, very stress relieving and that the songs pinched her heart. Miranda is the President of a Bontoc Organization in Baguio and hails from a family of musicians. In a follow-up interview held over the phone, Miranda further appreciated the natural blending of the voices and described it as ‘heavenly’ and not conservatory. “Nagmaya-mayat ti melody ken bagas na [the melody and substance is so amazing],” Jeff Buton, a taxi driver from Bukod, Benguet also expressed. “Parte tayo amin ti [we are all part of the] successful launching of the Less Traveled Road,” DepEd Baguio Supervisor Brenda Lee Celino said as she claims their share in the success of the event. Atty. Dublin Facullo, one of the lawyer audiences, described the group performance as ‘boundary-less’ with its 10 collection of inspirational and educational songs which is a product of the collaboration of the different local talents in the Cordilleras. She added that their group is honored to be invited as one of the guests. “Mayat nan kad-nga na. Aye, mankakakaan nan be-ay [How nice to the ears, it so relieving],” remarked by Jesreel Kamideng, a laborer. “Adu pay ti turungen daytoy nga grupo [this group will achieve more] in the future,” Satur Bultikan (fondly known as Mr. Sato), CTBR owner, also underscored as his stroke of luck to the group. Looking forward to the group’s future endeavors, former Baguio City Councillor Rocky Balisong and incumbent La Trinidad, Benguet Councillor Henry Kipas also committed to support to the LTR through their networks. Further, Dobie De Guzman, ABS-CBN Northern Luzon personnel, also expressed his appreciation to the songs and the artists. De Guzman said he will assist in the popularization of the pieces in various media. The Dap-ayan ti Kultura ti Kordillera (DKK) cultural group also showcased their originally composed indigenous songs as a preliminary to the group’s performance. Julius Dagitan, DKK representative, conveyed his compliments and encouraged the LTR to come up with more original compositions. Aside from the album launched, Dagitan challenged the group to release an ethnic inspired album which he termed as sariling atin. “We thank all our supporters from all walks in this endeavour. Dakayo ti inspirasyon dagitoy ubbing a mangitultuloy ditoy trabaho da as artists. Agyaman kami la unay [You are the inspiration of these youth to go on with their work as artists.] No awan kayo, awan daytoy nga taripnong. [Without you, this activity would not have been possible] We thank you very much,” said Dr. Nieves A. Dacyon, the LTR album composer. “Gapu ti tulong yo, nabiag daytoy nga grupo [because of your support, this group survived],” Dacyon said to express her gratitude to all the supporters of the LTR. As an emerging musical group devoted to push for the development of the Cordillera young talents along music, the arts and related programs, the composer shared that the group will soon provide assistance to other local artists through series of training to complement relevant and transformative music for all walks in the region. The Less Traveled Road tracks its growth from January and was able to fast track the release of its album to provide support to Beatriz Joven De Vera, a cancer patient, as its first beneficiary. “This is actually a breakthrough for us as local artists. 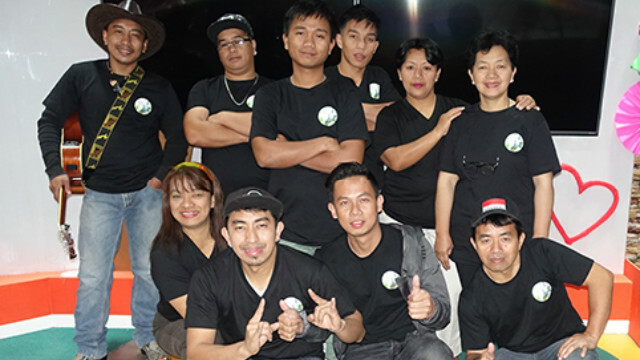 We take pride from being chosen to be a member of the LTR and exhibit our expertise essentially by dealing with all-original compositions from lyrics, melody and musical arrangement,” Barney Jones Oloan Joven, LTR recording artist and sound engineer stated. “We take all comments, whether good and bad, in our favor. These are actually the challenges for us to further advance our career,” Mark Lister, LTR lead guitarist added. Meanwhile, the LTR band will be performing during the celebration of the Ayyoweng Festival to be held in Tadian, Mt. Province on March 3, 2018 considering the Holy Rosary High School (HRHS) as its second recipient. HRHS is a catholic school delivering quality education in Kayan East, Tadian, Mt. Province that needs total replacement of its worn-out building. The Resource Mobilization Team of the HRH Alumni Association appreciates and welcomes sponsorship of said concert for this purpose.